Victoria Scott at the Waldo County Superior Court on the first day of her trial Monday. Scott is charged with manslaughter in the stabbing death of Edwin Littlefield in February 2017 in Waldo. 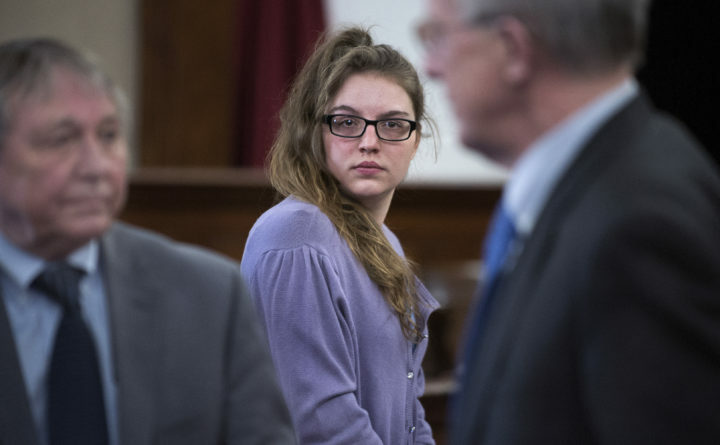 BELFAST, Maine — Edwin Littlefield’s life could have been saved by basic first aid — keeping him still and putting pressure on his stab wounds — or a prompt 911 call, the state medical examiner testified Tuesday during the manslaughter trial of Victoria Scott. Scott is accused of stabbing Littlefield repeatedly in the driveway of a mutual friend’s home in Waldo in February 2017. Scott claims Littlefield was straddling her, pinning her to the ground while striking and choking her, and that she pulled a switchblade out of her pocket and used it in self defense. Mark Flomenbaum, Maine’s chief medical examiner, conducted the autopsy on Littlefield’s body. He testified that he found 11 “sharp injuries” — cuts and stab wounds — on Littlefield’s body. There were five stab wounds on his left thigh, including four that were “clustered” together and at the same angle, indicating they happened in rapid succession. There were two more in his left calf. “Those were the injuries responsible for his death, they cut deep arteries and caused an enormous amount of bleeding,” Flomenbaum told jurors, adding that two major arteries were severed in Littlefield’s leg. Littlefield also suffered a cut on his index finger, possibly a defensive wound, a cut on his scalp, a stab wound to his arm and another to his abdomen, Flomenbaum said. Another cut above his right eye was likely caused by a blunt force impact. As images of Littlefield’s body and wounds were displayed on courtroom screens, Scott stared down at the table. The medical examiner said the types of injuries Littlefield suffered typically aren’t fatal if treated quickly. A tourniquet, or quick response by anyone in the house, an EMT, or Littlefield himself could have slowed the bleeding enough to save his life. Had Littlefield stayed still, the bleeding also might have slowed to the point where it did not imperil his life. Instead, Littlefield limped down the driveway, and entered the basement of the house as he continued to bleed out. Prosecutors say he likely didn’t realize how serious his injuries were. Defense attorneys say he went into the basement looking to fight. He was found dead in the homeowner’s truck parked in the driveway by a family member of the homeowner, who called 911. The stabbing happened after Scott overheard Littlefield tell the homeowner that she shouldn’t trust Scott, whom he called a “junkie” and several obscene terms, according to court testimony. Prosecutors say Littlefield was leaving, walking down the driveway, and Scott pursued him into the driveway and provoked the fight. An emergency room physician at Waldo County General Hospital and a Belfast paramedic, both of whom treated and examined Scott on the night of the stabbing, also testified Tuesday. They said they didn’t find significant injuries on Scott, and didn’t note any bruising or cuts to her face, neck, back or torso that would be consistent with being beaten on the ground. CAT scans also didn’t reveal anything abnormal. Scott suffered a wound to her thigh, likely caused by a knife, which was closed with seven stitches. Questions are swirling in the trial about what happened not only in the driveway, but also what happened afterward when Littlefield entered the basement of the house and met Josh Dorman. Dorman and Scott were staying at the Waldo home as guests of the homeowner, Rose Newton. Newton gave Dorman rides in exchange for helping out around the house. Dorman and Scott also purchased prescription medications from Newton and allegedly abused them, Dorman testified Tuesday. Littlefield was also a friend of Newton’s, and stayed at the home periodically. Dorman said neither he nor Scott had argued with Littlefield before that night. Dorman admitted on the stand that he lied repeatedly to police investigators and attorneys about what he saw and did that night. Dorman changed his story multiple times during police interviews. He now says that his claims that he saw the struggle in the driveway, the specifics of where he saw Littlefield after the stabbing, his outline of the sequence of events, among other details, weren’t true. Dorman said much of what he told police that night was a “bunch of bullcrap,” and that his drug use likely affected his observations and memories of that night. He maintains that he walked into the basement and Littlefield moved toward him with his hands raised as if he was going to choke him. Dorman said he pushed Littlefield down and Littlefield hit his head. Dorman claims he helped Littlefield stand up and walk out of the basement and to the truck. He denied under questioning that he had a knife, or that he assaulted Littlefield in the basement. Police doubted his story because there were two large pools of blood on the floor with a streak of blood between them, as if Littlefield had been dragged across the basement floor. Dorman said he couldn’t explain the blood patterns. He said he didn’t notice the amount of blood on the ground and didn’t believe Littlefield was that severely injured. Scott allegedly told investigators that Dorman claimed to have “beat up” Littlefield in the basement. Dorman said that was a lie he told in hopes it would impress Scott, who he had strong, unreciprocated, feelings for. Scott’s defense attorneys have speculated an altercation in the basement could have sped up Littlefield’s blood loss. Dorman agreed to testify in exchange for immunity from any prosecution for drug crimes based on what he said on the stand, and said it was his understanding that he also wouldn’t be charged with manslaughter. It’s unclear whether he might face future charges for lying to police. Prosecutors expect to call a few more witnesses Wednesday. The trial is expected to last through Friday.